They were not quite as I hoped, but I must say that I love them. It was extremely difficult to photograph at this time, it was storm in the gusts, and I had to anchor the tripod and camera properly to not get shake in the exposures which were more than a minute long. The difficulties made me forget everything I knew about reciprocity effect … So most of the pictures I made was heavily underexposed unfortunately. This may look peaceful, but I assure you it wasn’t…. 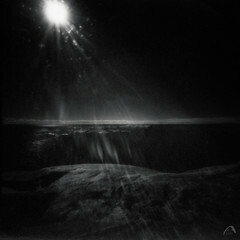 Wow, I would like to see them, I love pinhole, and with that filter it must be absolutely gorgeous! Do you have them up on your blog? 1 1/2 minute for more correct exposure. Interesting stuff! 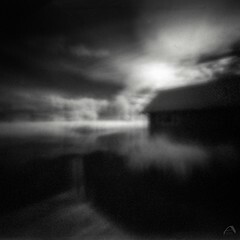 I haven’t uploaded many of my super long pinhole exposures just yet. There’s only one uploaded so far. It’s the shot with bamboo trees. In bright daylight, I think it was about a three or four minute exposure. Yes, even the ghosts disappear ( unless they happen to be still, lazy ghosts ^^ ) I found this method works best for landscapes with moving clouds. It gives a surreal, dreamy atmospheric look to the photo. Well they may not be quite what you hoped but they are really great – I especially like the first one (and I’m not usually a fan of long exposure shots of moving water as they rarely look like water in my opinion). As you say, it looks peaceful, strangely calm and soothing despite the storm (good job you didn’t take the Wista on this occasion!). Thank you very much! Happy you like them! If you like it, would would you mind if I published it on my grumpytyke blog with your picture as one of my ‘picture haiku’ ? – picture credited of course. Great haiku! I so wish I could myself…..but I enjoy others haiku greatly! (where I was able to introduce the spacing ‘punctuation’ which is a (necessary) part of my haiku). I think you did a great job in light of the stormy conditions. I too am not a big fan of “milk” water. However the detail you got in the rocks is superb. I like the second photo best because of the rocky horizon. If the weather had been better I had been taken much more color images than I did. It is very beautiful there, the cliffs are mostly red granite, very beautiful. I took a couple of color films, but have not had the time yet to scan them all. Marie, they turned out beautifully! Very dreamlike, and I think the softness of the water against the sturdy rocks enhances this. Thank you very much! Yes, I agree, that contrast is so great for the images. All of your efforts paid off, these are breathtaking. I love the sharp, smooth surface of the rocks with the white motion of the water. Wonderful. Thank you very much! That’s true, efforts pay off 😉 That was also the reason I hold them for while, to see if they were really good, or if it was just my efforts that made me like them…. Your description of that moment lead me to the correct interpretation of these photographs in which the smooth rocks that continue to be shaped by wind and water. Gosh, these are amazing! The first photo is a little deceiving in that the water actually looks like clouds (or mist) sweeping over mountain tops (the rocks). This is truly art. Well done! You’re welcome! Also, I have serious camera envy. How long have you had the 503? What’s it like to shoot with? The prices are rising, so hurry and get yourself one of these, the 500C is a wonderful wonderful piece too! Great composition in both photo’s. I especially like the first one with the white light (water) contrasting with the dark rocks and leading the eye across the picture. Pan f+ is (I think) a tricky film to use anyway, especially for long exposures. I’ve been using these adjusted times for reciprocity compensation with Pan f – 2secs = 4secs, 4secs = 10secs, 8secs = 25secs, 15secs =55secs, 30secs = 2min 40secs. Metered time first and shot at box speed and developed for 10.5 minutes in D76 1:1 @20c. Seems to be working so far! Thank you John, great info! Then I really understand the under exposure, I decided on exposure times ranged from 30 to 60 seconds, and stuck with them. I suppose I was lucky to even have this result then…. Thank you very very much for your kind words, and for visiting my blog! My friends and I have been playing with soft-water shots, too—usually in the evening at sunset, but I am anxious to try with a ND filter during the day. I have an old film Hasselblad, but haven’t used it in years since going to digital. Places to develop film seem to have vanished from my island (Oahu, hawaii). Oh, you should try it, it is so fun! I had a film with 50 ISO, and I exposed for one minute, (should have exposed for two…) That was in the middle of a sunny day. Sad about developing labs… Why not pick up your nice friend Hasselblad, go out and shoot some film, order some chems online and develop your own film, It is actually quite easy. You do not need a darkroom, just a loadingbag and some other stuff. Good luck!! And thanks a lot for your visit and comment on my blog! At first sight I thought these were pinhole shots!! Amazing photos! I’m glad that you told us there was a storm. It helped me imagine it all, the sounds, winds, feel of it when I looked at the photos. In the second photo there is a rock that looks like a wide open mouth ready to eat the storm. I like the first image quite a bit. The tonal range is wonderful, especially how the gray sky cuts through the top of the photograph lightening up the scene ever so slightly. The long exposure does well to exemplify the repeated pounding the ocean gives to the rocks, slowly smoothing and changing the shape of the rocks. Your right it does look peaceful, but I’m sure it was anything but. No,it was a real battle, it was even hard to get there… Keep the camera and tripod steady and protected against salt water spray. Kul att träffa på en landsman här, inte så ofta det händer.. Men du bor inte i Sverige, eller? Loved the top photo especially and the zen saying. 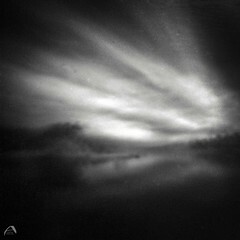 I pinned the top photo to my b&w photography board on Pinterest http://pinterest.com/gaylealstrom/photography-black-white/. I hope you don’t mind. I would like to give you photo credit but don’t know your name. Thank you very much! It’s okey, you left my web address.